This compilation of worksheets provides a perfect launch pad for young ones to grasp the concept of writing number names for single-digit, two-digit and three-digit numbers. 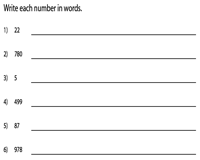 Our combined review worksheets provide ample practice in writing numbers in words from 0 to 999. Use the various download options to gain access to all our worksheets under this topic. Get your little ones to recognize, read, and write number names for this collection of worksheets that have been divided into three levels to include ones, tens and hundreds. This differentiation facilitates easy downloads. 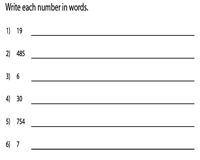 Boost your child's confidence in writing down the number names for this series of worksheets that contain a mix of 1-digit, 2-digit and 3-digit numbers. 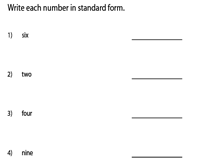 Test children's ability to represent the given number names in numeral form with this multi-level range of worksheets that feature number names up to three-digits. 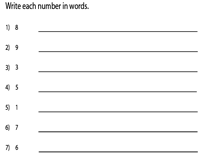 This group of mixed worksheets contain 1-digit, 2-digit and 3-digit numbers in word form. Write each number word in standard form. Become a member to get a complete access to all worksheets. Free worksheet is included. 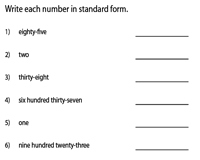 This ensemble of combined review worksheets is an excellent resource to help children interpret numerals as number names and vice versa. 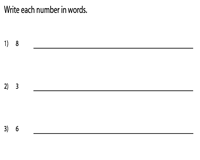 The worksheets have been segregated based on the number of digits. Review young one's ability to write both number names and numbers with this assortment of mixed review worksheets that include up to 3-digit numbers/number names. Use the answer key to verify their responses.